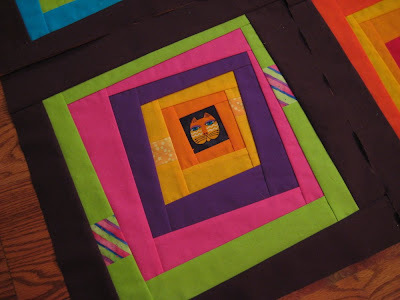 FlossieBlossoms: I got my wonky log cabin blocks finished for the Hooter quilt today! 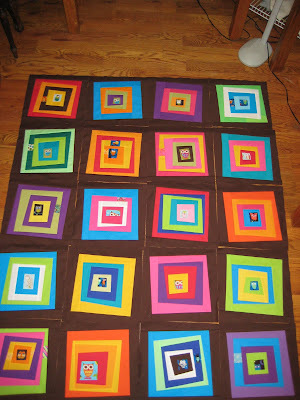 I got my wonky log cabin blocks finished for the Hooter quilt today! And I'm glad they're done, they were consuming all my time and the craft room is a wreck! 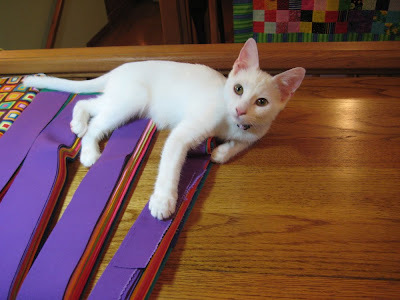 I need to get busy on special orders and purse making. I have a few obligations to finish up and I am NOT good at working on several different things at one time, I seem to be able to cover every slightly flat surface with stuff and then I can't find anything. I love finishing things up so I can put all the bits and pieces away! I think this is the final layout unless I spot a problem, I have to photograph it and then put all the blocks up or the cats will make a mess of them and if anyone tore them up, I'd be miffed. This funny little guy is in one of my favorite blocks, it's simple and sweet, kind of like he is, I imagine. And what the heck? 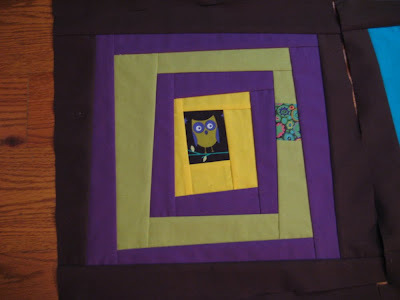 There's a pussycat in the owl quilt! How did THAT get there? Nosey Parker must have done that when we were all asleep. Love the layout, I think this will be gorgeous!! And I love Nosey Parker(naughty little fellow,lol! )What a cutie!! Love these blocks and the layout. You go girl! Can't wait to see it quilted up. *guffaws* I love that cat!! The one in the quilt, like - the white one? Not so much. Joking!! This will look fantastic!! How you going to quilt it?